My name is Robert Bernt, and my wife Kristine and I have 12 children who are all involved in some capacity in the success of Clear Creek Organic Farms. 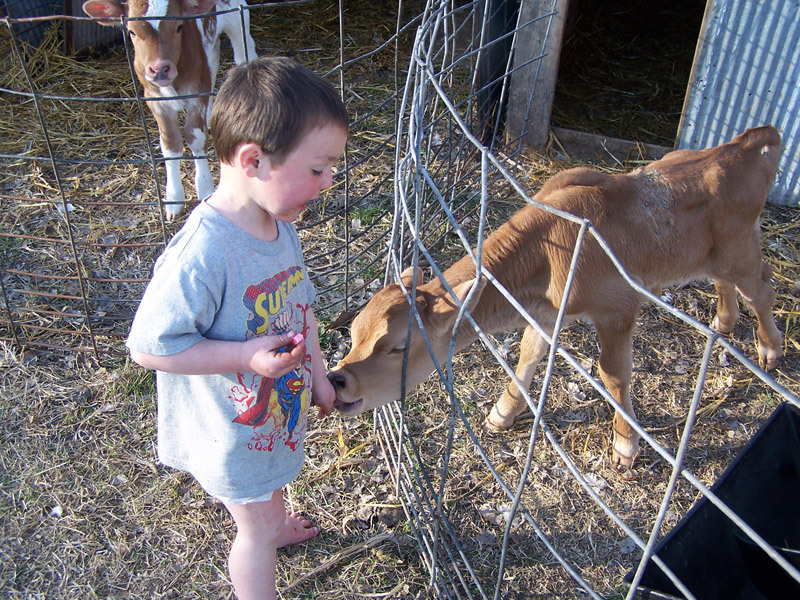 Our entire operation is certified organic and strictly grass fed. 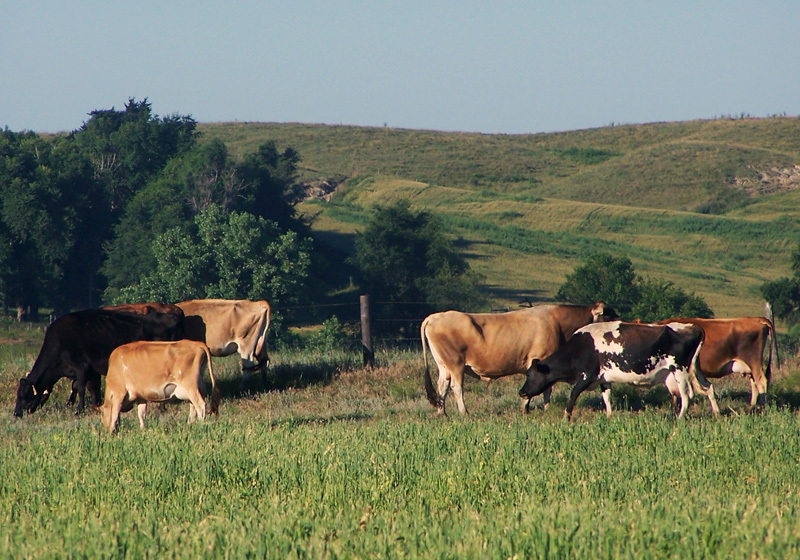 Our dairy cattle receive only grass and are rotated daily in a variety of native and irrigated pasture. We have a very diversified operation. The dairy consists of 80 adult Jersey-Normandy and Holstein-cross cows. We ship our milk to a small plant in South Dakota to make our cheese. It is not mixed with any other milk. None of our livestock are treated with hormones or antibiotics. We use homeopathy if treatment is needed. We firmly believe that healthy land produces healthy products which in turn help with whoever or whatever consumes it. 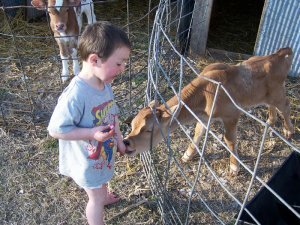 Our farm motto is “Producing healthy food for healthy families.” This is something we live and breathe here. With twelve children of our own, their health is of greatest importance to us. I am the 4th generation to farm this land. It was homesteaded by my great grandfather during the Kincaid act. We are located west of Spalding, NE along the beautiful Cedar River. A small stream called Clear Creek joins the Cedar River on our land. This is the reason for our farm name. We own 880 acres of pasture and farm ground. The pasture is mainly Sandhills grass with huge rolling hills formed during the ice ages. Two and four legged babies enjoying each other at clear creek organic farmWe truly believe in what we are doing here at Clear Creek Organic Farms. We think we can make a difference in the health of families that consume our products. We feel so strongly about this that we offer a satisfaction guarantee with our products. We not only welcome but encourage people to visit or contact us to learn more. As producers of your food, it is as important for us to meet you, the consumer, as it is for you to meet us. We’d also love for you to attend our field day in August, which includes a complete farm tour. With the help of our consumers and friends, we were GREATLY honored with the 2010 Nebraska Sustainable Agriculture Society Sustainable Farmer of the Year award. We make 10 different flavors of cheese, and we sell off the farm milk and cream. We have also experimented with grass fed organic ice cream at the UNL ice cream facility in the past and are considering doing so again in the future. The thing that sets our product aside from others is the high level of CLA’s and Omega 3’s in all our products due to the grass they consume. This has been proven to be a huge health factor that is becoming very important to consumers. Along with the health benefits, this creates a smooth creamy texture in our cheese that is hard to beat. We try to hold the price of our products down because it is very important to us that everyone can afford a healthy wholesome product. We do pasteurize milk for our cheese currently, but this spring we are going to try some varieties with raw milk, due to a large number of requests. We sell our products through the Nebraska Food Coop. We do sell in a number of stores in Omaha, Council Bluffs, Lincoln, Fremont, Grand Island, Hastings, Kearney, Sioux City and numerous small towns. We also sell off the farm. Hi, I saw your e-mail in a Nebr. magazine. I am really impressed with your farm operation. You have some good looking cows in that pasture. Do you have any new baby calves yet? I will come and see it some time. I am a neighbor to Raymond’s lot in Lindsay. Thought I would let you know that the fence he put up around that burnt house keeps coming down with the winds we ‘ve been having. I put it up a few times, but it doesn’t stay very long.